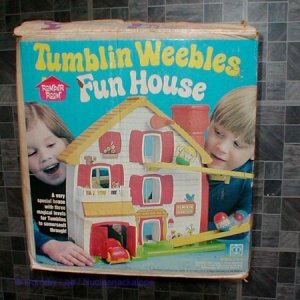 Description: The Tumblin Weebles Fun House allows the Tumblin Weeble figures to tumble in a variety of ways and directions. 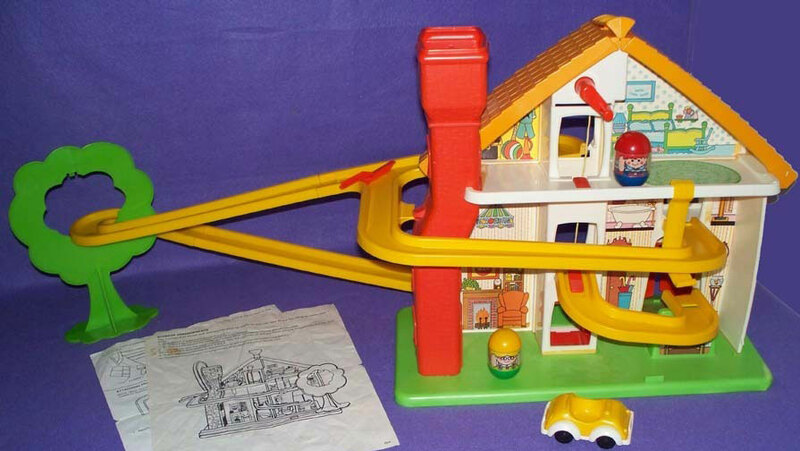 Take the elevator up, roll down long ramps, loop through trees, and land in a car. Fun House Base - HTW375 - White 3-story 2-side "house" with a green rectangular base, an orange chimney on one side, and a yellow roof. 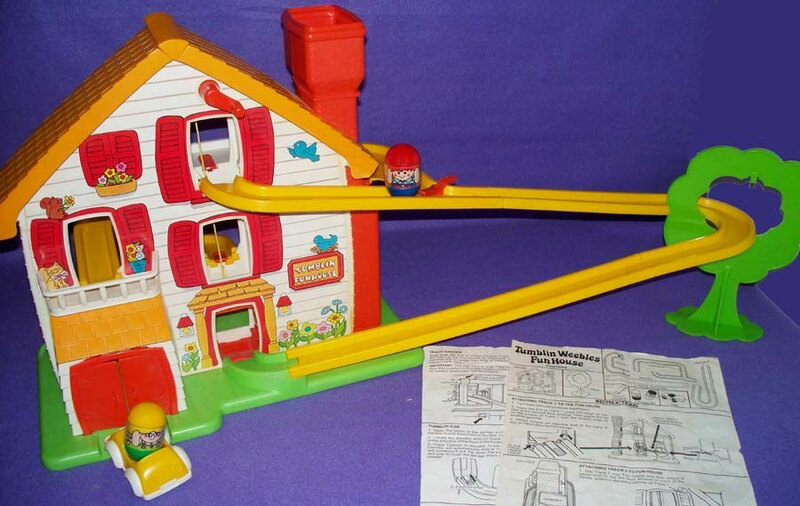 Front of house has a garage with 2 orange doors, a balcony with rail above the garage, and an orange hand-crank near the roof (above front door and 2 windows). Other side of the house (the inside) has a white elevator shaft with an orange elevator cage. Front House - Large litho of white siding home, yellow posts and roof over door, and 4 windows with red shutters (small window has closed shutters). Sign by door marked "Tumblin Funhouse". Livingroom (Inside) - Large litho of chair by fireplace, wallpaper walls, picture on wall. Hall & Tub (Inside) - Tall narrow litho of wallpaper wall, grandfather clock, and unbrellas in a stand. Top part of litho has bathroom with white antique bathrub. Foyer & Scales (Inside) - Tall narrow litho of wallpaper wall and a fishbowl on a stand. Top part of litho has bathroom with scales and towels. Kitchen (Inside) - Small rectangular litho (fits on end of garage ramp inside house) of a blue/white checkered wall, brown kitchen table and 2 chairs. Closet (Inside) - Small yellow triangular litho of a ball and horn on floor and clothes hanging in closet. Bedroom (Inside) - Large triangular litho of room with white walls, blue polka-dots, green/yellow furniture, and blue/white bedspread. Rug - Green "fuzzy" oval rug (fits on bedroom floor). Tree - HTW376 - Flat green tree with a hole in the center and s flat support base on the bottom (to stand upright). HTW377 - Large yellow ramp with a large C-shaped "road" attached to a straight "road": has an orange movable lane changer where the roads meet. The end of the straight road has a square peg (to attach ramp to other pieces). One inside edge of the c-shaped road has a tab (to rest on ledge on fun house base). HTW378 - J-shaped ramp road. Each end of the road has a square peg (and side pegs) to attach ramp to other pieces. HTW379 - Straight ramp road. One end of the road has a square peg (and side pegs) to attach ramp to other pieces. Other end of the road has a square peg (to attach ramp to other pieces). HTW380 - Small C-shaped road/ramp. One end of the road has a square hole (to attach ramp to other pieces). Other end has an orange tilt tab. HTW381 - Small L-shaped support arm with a hook on one end (to hook onto edge of funhouse) to support ramp pieces. Car - HTW382 - Yellow top, white base 1-seat car. Bottom of car is marked, "©1973 Hasbro®". Tumblin Weeble Girl with Glasses - HTW370 - Green base, yellow top (hair) girl with glasses. Has a white shirt and green overalls with red heart designs. Tumblin Weeble Boy - HTW371 - Blue base, red top (hair) boy with a blue/white stripe shirt with light blue collar and a red belt.